Looking for free food and drinks all year round? Each month, dozens of restaurants, fast food chains, and ice cream shops across the U.S. offer freebies and discounts to customers on national food days. Visit a participating location during a free food day to nab treats, like a donut, Slurpee, bagel, pancake, and more! What are you waiting for? Mark your calendars, get set, and go eat! Before you hit the drive-thru, make sure you also have a great price on your car insurance. Call 1-877-DIRECT (1-877-463-4732), go online, or find a store location near you to get a quote or review your existing policy. 1/19 (National Popcorn Day): Pop by your local movie theater to discover deals on popcorn for National Popcorn Day! Typically, AMC Theatres, Paragon Theaters, and Regal Cinemas offer coupons online for free bags of this popular movie snack. 2/9 (National Bagel Day): Bagel chains like Einstein Bros typically offer promotions on National Bagel Day. Joining their Shmear Society loyalty club could help you score a free bagel at participating locations on this day. Your neighborhood bagel shop or bakery may also have deals on bagels. 2/9 (National Pizza Day): Pizza lovers, rejoice! On National Pizza Day, follow your favorite pizza restaurants like Domino’s, Pizza Hut, Papa John’s, Chuck E. Cheese, California Pizza Kitchen, and Sbarro to get special deals, coupons, and freebies. Don’t miss out on your slice of the pie! 3/5 (National Pancake Day): National Pancake Day falls on Shrove Tuesday, or Fat Tuesday, which is a holiday traditionally celebrated by eating pancakes. On this day, IHOP gives customers a complimentary short stack of original buttermilk pancakes. Don’t forget the syrup! 3/14 (International Pi Day): Math fans celebrate 3.14 (π) on Pi Day, but pastry fans celebrate pie! A number of restaurants and bakeries use the play on words to offer deals and freebies. Boston Market often offers a coupon for a free rotisserie chicken pot pie with purchase. And grocery stores, like Kroger, sometimes mark pies down to $3.14. 3/20 (First Day of Spring): On the first day of spring, enjoy the warmer temperatures with a free, small soft-serve cone from Dairy Queen, and/or an Italian ice from Rita’s Italian Ice. Celebrate spring, and your savings! Be sure to visit their official pages for further details and participating locations. 4/9 (Ben & Jerry’s Free Cone Day): If you live near a Ben & Jerry’s scoop shop, take advantage of their Free Cone Day. The ice cream duo has been running this event since 1979 and could be considered free ice cream day pioneers! 4/15 (Tax Day): For some, Tax Day can painful. However, free food could help lift your spirits! Cash in on Tax Day by following your favorite restaurants like Hardee’s, Arby’s, Cinnabon, Boston Market, Chuck E. Cheese’s, Quizno’s, and Potbelly Sandwich Shop which have been known to offer free food or discounts on this day. Once you sign up or follow them, they’ll notify you about their offers! 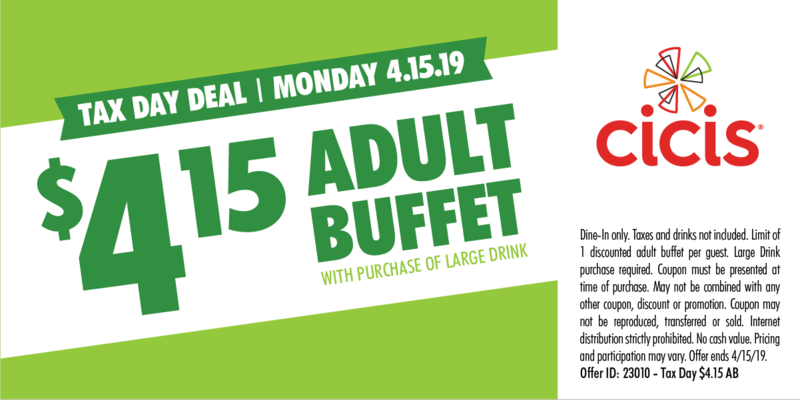 Update: Download this tax day coupon from Cicis for a $4.15 adult buffet. 4/26 (National Pretzel Day): What better way to celebrate National Pretzel Day than by eating a hand-baked pretzel? The famous pretzel maker, Auntie Anne’s, is known to offer customers free or discounted sweet or salty twisted treat on this day. 5/12 (Mother’s Day): Take your mother or mother-figure to a participating TCBY for free frozen yogurt! Frozen yogurt is healthy, right? 5/14 (Haagen-Dazs Free Cone Day): Like Ben & Jerry’s and Dairy Queen, Haagen-Dazs also has a free cone day! Find a participating shop online to claim your free ice cream. 5/28 (National Hamburger Day): Most restaurant chains that are known for their hamburgers — McDonald’s, Steak n Shake, Wendy’s, Carl’s Jr, Wayback Burgers, and Jack in the Box — offer coupons for National Hamburger Day. Typically, the burgers aren’t actually free, but you could save some money. Promotions change from year to year, so follow your favorite restaurant to stay in the loop. 6/7 (National Donut Day): On the first Friday of June, donut shops like Krispy Kreme, Dunkin’ Donuts, and Shipley celebrate everyone’s favorite fried dough by offering free donuts, or a deal! Do-not miss out on your free donut! 3rd Fri. (National Flip-Flop Day): Tropical Smoothie Café started National Flip-Flop Day in 2007 to celebrate its 10th anniversary and donate some proceeds to charity. It’s continued ever since. All you have to do is wear flips flops to one of their participating locations to get a free 24oz. smoothie! 6/16 (Father’s Day): Did you take your mother to TCBY for free frozen yogurt in May? Well, for Father’s Day, you can treat your dad or father-figure to a free TCBY frozen yogurt, too! 7/9 (Cow Appreciation Day): Chick-Fil-A created Cow Appreciation Day to show appreciation to their customers and their “Eat Mor Chikin” Cows. How do you participate? Visit a participating Chick-Fil-A wearing something cow-like to receive a free entrée. 7/11 (Free Slurpee Day): On 7-Eleven Day, also known as Free Slurpee Day, 7-Eleven convenience stores around the country give away a free small Slurpee to each customer. 7/13 (National French Fry Day): What are your favorite fries? Crinkle-cut, curly, waffle, or steak-cut? On National Fry Day, you can take your pick and save some cash! Follow McDonald’s, Wendy’s, Wayback Burgers, Steak ‘N Shake, or Checkers for coupons. 8/6 (Root Beer Float Day): Root beer is pretty tasty on its own, but a scoop of creamy vanilla ice cream makes it extra delicious. Plus, free makes it even better! On Root Beer Float Day, A&W Restaurants are known to hand out free small Root Beer Floats. Don’t let this deal float away! 8/24 (National Waffle Day): Free waffles and breakfast deals are available nationwide on National Waffle Day. Follow Huddle House, White Castle, Denny’s, Bob Evans, and Waffle House to discover each restaurant’s offers. 9/29 (National Coffee Day): Raise your mugs to coffee! To celebrate National Coffee Day, many coffee retailers offer freebies and discounts on coffee. For example, Dunkin’ Donuts and Krispy Kreme Doughnuts often have yearly coffee promotions, or your local coffeehouse may have one as well! 10/4 (National Taco Day): You may already participate in Taco Tuesday deals, but National Taco Day is the whole enchilada of taco savings. Follow your favorite taco restaurants like Taco Bell, Chipotle, or a local establishment to learn about taco promotions to take advantage of! 11/3 (National Sandwich Day): What’s better than a sandwich? How about a free or discounted sandwich? On National Sandwich Day, scope out deals from your favorite sandwich spots like Subway, Schlotzsky’s, or Potbelly’s. Whether it’s a buy one, get one free deal, a free sandwich with purchase, or special pricing, your sandwich will surely hit the spot. 11/16 (National Fast Food Day): On National Fast Food Day, restaurants like McDonald’s, Burger King, Arby’s, Subway, Taco Bell, Arby’s, Krystal, Sonic, White Castle, and others typically celebrate by offering free or discounted deals to customers. Visit your favorite restaurant’s website to learn about offers. 12/4 (National Cookie Day): Celebrate National Cookie Day with a free cookie! Follow American Cookies, Mrs. Fields Cookies, Toll House Café, and Cinnabon online to discover delicious cookie deals!